I absolutely adore gold nail polish. 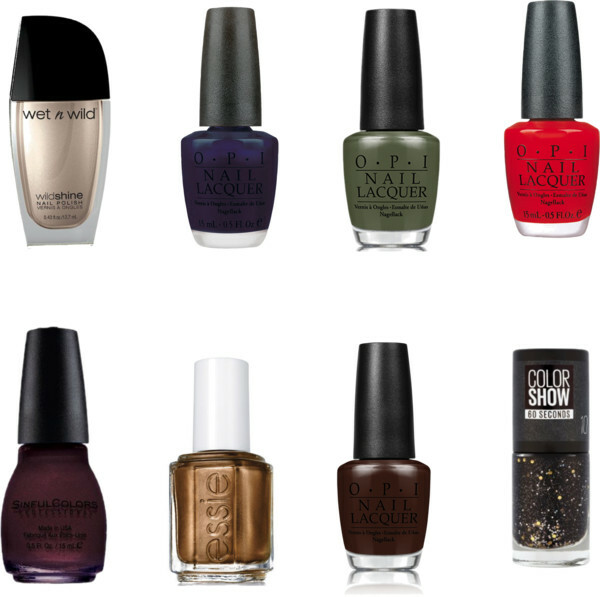 I have many different shades but I am loving this lighter shade by Wet N' Wild. It's so pretty and I love the fact that it only costs $2. I have never really been a fan of blue nail polish but I am loving this gorgeous navy hue that O.P.I. has. Its dark but such a pretty color and I am excited to try this color out. This season I am all about olive. I just find the color to be so pretty and I can't wait to try this color on my nails. Red nails are a classic. I always paint my nails this color. It's a color that will never go out of style. I have about ten different red polishes and I just feel extra classy when I have red on my nails. Y'all, burgundy and wine are my two favorite colors. I can not buy anything in these two colors. Hands down, one of my go to nail colors for Autumn. It's a deep hue that compliments my complexion and I just love this color. Sinful has a variety of beautiful shades for $2. Another one of my favorite colors. I wear a similar shade like this one year round and I like that it has a golden tint to it. It's a beautiful shade. I bought my first brown nail polish in September and I am a big fan. I don't know why I never used this color before but I am feeling it. I have one black polish in my collection. I'm kind of excited to try a new hue, especially if it has glitter in it. I will be hitting up my local Target and Wal-Mart to find this pretty shade by Maybelline.